Supply all the local hospitals with interpreters on a 24 hour basis. They are also included in the National Emergency Plan, as well the Mountain Rescue. For details please contact Cathy Goode, 13 Bruach na Laoi, Union Quay, Cork. (021) 4316 022. The NHS in the UK have prepared Emergency multilingual phrasebooks that are available for download. Please note that the information they produce is under Crown copyright, which is administered by Her Majesty's Stationery Office. Local copies (linked below) have been reproduced with permission (Core Licence from UK Crown Copyright). 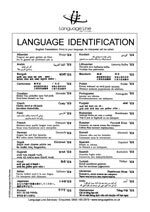 If you are unsure which interpreter is needed, the language identification sheet may be useful. More HSE background information please see Guidance in Using Interpretation Services. For text translation you could try using the translation facility available with Microsoft Word or Altavista's BabelFish. Content by: Cathy Goode, Dr Íomhar O' Sullivan 15/11/2004. Reviewed Dr ÍOS 22/01/2007. Last review Dr ÍOS 13/11/18.